The world of hunger research is expanding into a variety of frontiers, from hormonal regulation to behavior and food choices. Understanding the complicated science of hunger and satiety can help your clients win their battle with obesity. “Hunger is a big part of why you eat. If you’re not satiated, hunger can be a big piece of weight control. In the big picture, if people don’t change lifestyle to overcome hunger over the short term, they will not stick with it in the long term,” says Beth Hubrich, MS, RD, executive director of the Calorie Control Council. Hunger is a body reaction that has served us well since the dawn of time. Hunger was an important survival mechanism for early man, prompting him to hunt and forage for food to power up and survive. In light of the modern obesity epidemic, the field of research on appetite has blossomed, diverging into many paths that explore aspects such as genetics, hormone regulation, behavior, psychology, and diet. Researchers are digging into everything from appetite-regulating neuropeptides and genetic characteristics in people who are obese to disinhibition behavior and the effects of food stimuli on hunger, hoping to gain insight into what makes us hungry and what quells the growling stomach. If you’re skipping the power of hunger control in your weight loss counseling strategies, you’re missing out. Barbara J. Rolls, PhD, Helen A. Guthrie chair in nutritional sciences at Penn State University, coauthor of The Volumetrics Weight-Control Plan, and author of The Volumetrics Eating Plan, has spent the past 20 years researching the field of hunger and obesity. She believes that dietitians need to be well versed on the latest hunger and satiety knowledge to best serve their clients. 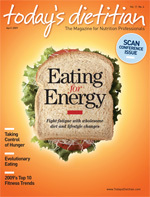 “I suspect that many dietitians do not know about the current state of science on hunger control. There is more mythology rather than real information. It makes sense that when you decrease energy intake below energy needs, people will feel hungry. This can undermine what you are doing for them in weight loss. This is key,” says Rolls. There is a lot of information, reliable or not, about appetite control floating in the wind, and it’s time for dietitians to get a grip on this crucial aspect of weight control. “I think there is a lot of misinformation on low-calorie foods and hunger and appetite in general among consumers and healthcare professionals. Consumers want to know what’s causing weight gain, and they want to trace it to one thing, but there is no magic bullet for weight loss,” says Hubrich. Hunger is defined as a strong desire or need for food, while satiety is the condition of being full or gratified. Energy homeostasis depends on a balance between energy intake and energy expenditure. Scientists are beginning to understand that there is a powerful physiological system at play balancing intake vs. output. The system is composed of afferent signals, which provide information to the central nervous system, and efferent signals, which are carried from the brain to the muscles and organs. The body relies on multiple redundant pathways to ensure that we maintain our drive to eat. Hormones circulate that act to initiate or terminate a meal or reflect body fat and energy balance. Signals are integrated by peripheral nerves and brain centers such as the hypothalamus and brain stem. The integrated signals regulate central neuropeptides that control feeding and energy expenditure. Most of the time, this energy homeostasis regulates body weight tightly. But researchers believe that the evolutionary pressure in our drive to eat may be out of whack when limitless food supplies are available. “There are lots of things going on in the body that affect appetite. The body wants to maintain its energy balance. You can’t trick the body into thinking it’s not hungry, as the body will override it. We couldn’t have survived this long without the body’s ability to feel hunger,” says Joanne Slavin, PhD, RD, a professor in the department of food science and nutrition at the University of Minnesota, who has studied the effects of foods on satiety. Of course, we know that appetite is also influenced by many things outside the realm of hormones and neuropeptides, such as food availability and exposure, cues, palatability, and emotions. And studies have consistently shown that increases in calorie intake can result from increases in food and beverage variety, increases in food energy density, and increases in the portion size of foods and beverages. Americans live in a beverage society. Consumers tote sports drinks and sweetened beverages, consume large quantities of soda, and have become addicted to flavored coffee drinks. Many people don’t realize that they’re often chugging hundreds of calories. But how do calories consumed in beverages affect satiety? “When you control macronutrients, usually food makes you feel fuller than the same amount in a drink,” reports Slavin, who notes that drinks deliver calories faster than solids. A 2008 Appetite study coauthored by Rolls investigated the effects of eating different forms of apples on satiety. The results showed that eating a whole apple reduced lunch calorie intake by 15% compared with the control group (no preload) and decreased calorie intake compared with applesauce and apple juice with and without added fiber. Overall, the whole apple increased satiety more than applesauce or apple juice. Several studies also suggest that substituting a beverage with a lower energy density for one with a higher energy density may be an effective strategy for reducing energy consumption at a meal. In a world that finds Starbucks’ coffee drinks exceeding the calorie content of a Big Mac, it’s an important strategy to look at beverage intake among those watching their weight. It may be good advice to start a meal with a low-calorie appetizer to calm the appetite. Evidence suggests that when people opt for a low-calorie first course, even though they may increase the volume they consume for the entire meal, the intake is lower. Possible mechanisms that lie behind the effects of a first course on appetite include cognitive and orosensory factors and variations in gastric distention and emptying. Soups and salads are examples of low-calorie appetizers that can take the bite out of hunger. A 2007 study coauthored by Rolls and published in Appetite tested the effects of consuming different forms of soup (broth and vegetables served separately, chunky vegetable soup, chunky-puréed vegetable soup, or puréed vegetable soup) as a preload on meal intake. Results showed that consuming soup significantly reduced test meal intake and total meal calorie intake by 20% compared with having no soup. An earlier study coauthored by Rolls and published in the Journal of the American Dietetic Association in 2004 discovered that eating a low–energy-dense salad reduced meal energy intake by 7% for a small portion and 12% for a large portion. Of course, it’s important to note that not all soups and salads are created equally; consider that a bowl of a restaurant’s baked potato soup can set someone back more than 500 calories. High–energy-dense soups and salads can potentially increase the total caloric intake of the meal. If a client is fighting hunger pangs, fruits and vegetables should be his or her first line of defense. “Foods that have higher water content allow you to have a bigger portion with the same calorie content. Vegetables and fruits rule,” says Rolls. On a day-to-day basis, people typically eat the same volume of food, she says. So controlling the caloric density of that food is the trick to controlling hunger and losing weight. With their high water volume and low caloric density, fruits and vegetables fit quite neatly into this category. Consumption of nine or more servings of fruits and vegetables is linked with low dietary energy density values. Rolls has built a body of work that demonstrates eating low–energy-dense foods such as fruits and vegetables maintains satiety while reducing energy intake. People can incorporate fruits and vegetables into the diet in many ways—for example, by bulking up recipes or simply including more servings of whole fruits and vegetables at meals or snacks. Think veggie lasagna with a large green salad and fruit for dessert, and you’ve got the picture. One fact seems pretty clear in satiety research: Fiber is a winner. “There is a lot of data on fiber and satiety. It’s not just viscous fiber that helps; insoluble fiber appears to stay in the gut for days, and a full gut tends to make you feel fuller for longer. Studies show that increasing fiber makes you feel fuller,” says Slavin. Fiber appears to work on hunger in many ways: by displacing available calories and nutrients from the diet; increasing chewing, which limits intake by promoting the secretion of saliva and gastric juices, resulting in stomach expansion and increased satiety; and reducing the absorption efficiency of the small intestine. In a 2001 research summary published in Nutrition Reviews, researchers found that with ad libitum energy intake, the average effect of increasing dietary fiber across all of the studies indicated that an additional 14 grams of fiber per day resulted in a 10% decrease in energy intake and a weight loss of more than 1.9 kilograms through about 3.8 months of intervention. Promoting fiber-rich foods seems like a sure winner in controlling hunger. “Eating more whole grains, whole grain pasta, whole grain cereals, fruits, and vegetables is important for satiety,” says Jessica Lee, MS, RD, LD, manager of nutrition communications at the Calorie Control Council. While eating whole grains can be an excellent way to increase fiber intake, Slavin cautions against lumping all whole grains into one category. “It’s the form of whole grains that are important. The marketing of whole grains has gotten ahead of the science. Now you see ‘whole grain’ snack foods and desserts,” says Slavin, who believes that whole food sources are the best bet for satiety. If you apply the energy density rules to many whole grain foods on supermarket shelves, a whole grain cookie just doesn’t match up to a bowl of oatmeal or a serving of quinoa. You don’t have to be a brain surgeon to realize that portion size significantly affects weight and satiety. Slavin places blame on our food culture, which values cheap, large portions over high-quality, moderate portion sizes. Satiety is linked with our view of what a “normal” portion size is. In a recent survey conducted by the American Institute for Cancer Research, seven out of 10 Americans said they finish their restaurant entrées all or most of the time, regardless of the entrée size. In a 2004 study coauthored by Rolls and published in the American Journal of Clinical Nutrition, study participants were served a lunch entrée at one of two levels of energy density in one of three portion sizes. Subjects consumed 56% more energy when served the largest portion of the high–energy-dense entrées compared with when they were served the smallest portion of the low–energy-dense entrée. Despite the 56% difference in energy intake between the two entrées, participant ratings of hunger and fullness did not differ after the meals. “Portion control so that people are eating less of energy-dense foods and eating more of low–energy-dense foods is absolutely critical for satiety. Overall energy density is important,” says Rolls. Helping people visualize appropriate portion sizes is key to getting them to realize that the mound of spaghetti on their plate at their local Italian restaurant is five times too much. We know that those who skip breakfast tend to weigh more and make up for lost calories—and then some—during the day. It’s common sense that skipping meals increases hunger, which can lead to binge-eating behavior. A gorging pattern of food intake has been shown to enhance lipogenesis and increase body weight, which may be due to large fluctuations in storage and mobilization of nutrients. It is thought that in a state of energy balance, increasing meal frequency may prevent large metabolic fluctuations. So what frequency of meals is the perfect combination? A 2008 study in the British Journal of Nutrition found that eating three meals compared with two meals with the same amount of energy increased satiety over 24 hours. “When you increase eating occasions, it’s more likely that you will eat more. I think that three meals a day, about every four hours, is good, but eating in between meals offers no real advantage,” says Slavin, who would like to see people encounter the fasting state in between meals instead of always being satiated. One thing seems sure: Passing up a healthy meal won’t do you any favors for hunger control later in the day. What about the all-important trick of macronutrient distribution? Should people manipulate their protein, fat, or carbohydrate intakes to lessen hunger? Rolls believes that the focus should be more on filling up on low–energy-dense foods rather than on percentages of fat, protein, and carbohydrate in the diet. It’s long been hypothesized that higher protein levels may increase satiety, but Rolls says the jury’s still out on that concept, adding, “A lot of studies suggest that protein affects satiety. I think we need more data before we can say that we need to increase protein for additional boosts of satiety.” On the other hand, it’s important to ensure that people meet their protein needs as they decrease calorie levels. “We usually think of protein as a percentage of calories, but there is an absolute requirement for protein. When people restrict calories, they may not be getting enough lean protein for satiety,” says Rolls. Speculation on carbohydrate intake and satiety has often fallen on the issue of glycemic index. A 2007 review of human intervention studies on glycemic index and satiety published in Appetite selected and analyzed 32 studies. The short-term studies showed evidence that low-glycemic foods or meals have a higher satietogenic effect than high-glycemic foods or meals. The mechanisms involved may be the specific effect of blood glucose levels on satiety and other stimuli involved in the control of appetite. But other studies found it difficult to tease out the separate effect of fiber on lowering postprandial glycemia. The researchers reported that it was difficult to conclude that low-glycemic index diets mediate a health benefit on satiety and body weight. The future for hunger control is bustling, with research exploring the satiety benefits of everything from pine nuts to novel fat emulsions. With so many complex issues surrounding appetite, it will be a challenge to keep abreast of emerging research and strategies for hunger control. But people will surely thank you for it.